"This Everton side could take the game to United, especially as Jose Mourinho’s side aren’t particularly adept at pressing." Match Odds: Man Utd [1.75], Everton [5.4], The Draw [4.0]. Manchester United's form might have improved slightly, with a victory over Newcastle and a good point away at Chelsea, but they've won just one of their last seven matches and that came in a contest where they managed to go 2-0 down against a relegation-threatened side. Jose Mourinho's men are not playing well, with major concerns at both ends of the pitch. It was notable that Mourinho named an unchanged side for the 1-0 defeat to Juventus, the first time he hasn't changed his starting XI in nearly a year. He then didn't make a single substitution in midweek, which suggests the thinks he might finally have stumbled upon the right formula. We could, therefore, see yet another unchanged side here. United, as ever, are suffering from injury problems. Marcos Rojo, Phil Jones, Scott McTominay, Marouane Fellaini, Jesse Lingard, Antonio Valencia and Alexis Sanchez are all unlikely to make the starting XI, which rather narrows Mourinho's options, and again hints that he could name an unchanged side. With David De Gea in goal, Mourinho is likely to continue with Ashley Young at right-back, even if Valencia is available. Young looks more comfortable in one-against-one situations and could be the better option against Everton's speedy wingers, with Bernard likely to play on their left flank. Luke Shaw has enjoyed a good run in the side of late, and should play up against fellow Southampton youth product Theo Walcott. In the centre, Victor Lindelof played well against Juventus, and his partnership with Chris Smalling seems reasonably stable. In midfield, Mourinho could switch to a more cautious trio by introducing Ander Herrera, but it seems more likely he'll continue with Nemanja Matic holding and Paul Pogba pushing forward. This combination isn't perfect, and Matic's lack of mobility is a serious concern in terms of stopping opposition counter-attacks. Still, this allows Juan Mata to play in his favoured number 10 position. In the last two matches he's been charged with nullifying Jorginho and Miralem Pjanic, but will surely be given a little more freedom here. Marcus Rashford and Anthony Martial will offer goalscoring potential from the flanks, although might be pushed back by the energy of Everton's full-backs. Romelu Lukaku should continue up front against his old side, but the Belgian looks badly out of sorts, lacking speed and unable to receive the ball in dangerous positions. 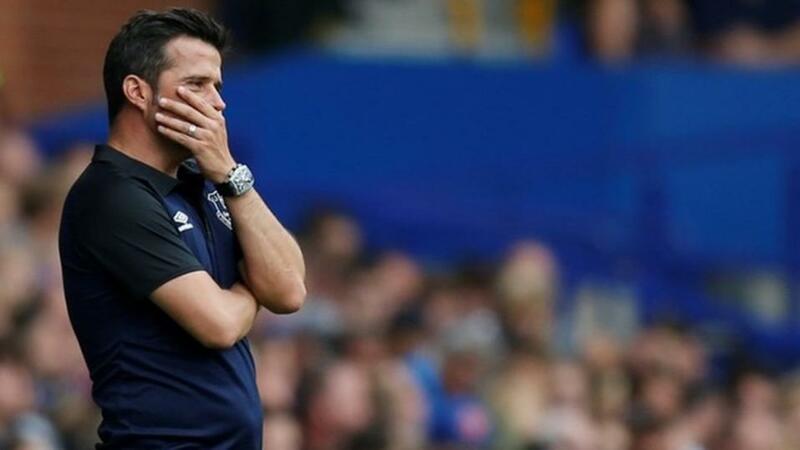 Everton's late victory over Crystal Palace in this time slot last weekend means Marco Silva has now recorded three victories on the bounce, and they come into this game two places ahead of Manchester United in the table. There's little reason to think Everton won't go for the victory here, against a disjointed side lacking cohesion and compactness. Jordan Pickford will be protected by Michael Keane and Kurt Zouma, who have looked good together in recent weeks and might keep the fit-again Yerry Mina out of the side. Right-back Seamus Coleman has been pushing forward well, seemingly recovered from the broken leg he suffered last year, while the crossing of left-sided Lucas Digne is also a major weapon in Everton's attacking armoury. Idrissa Gueye is amongst the Premier League's best ball-winners in midfield, while newcomer Andre Gomes offers more guile in possession than Morgan Schneiderlin, the man he's effectively replaced. This Everton side could take the game to United, especially as Mourinho's side aren't particularly adept at pressing. The question, though, is where Everton's goals come from. Gylfi Sigurdsson can score the odd screamer, and contribute from set-pieces, while Theo Walcott can sprint in behind. Richarlison, though, is still adapting to playing up front and Bernard is more of a touchline-hugging winger than a goalscorer. Notably, Everton's goals last weekend came from the bench. Nevertheless, I still find it difficult to imagine United keeping a clean sheet - they've conceded 15 goals in nine league matches this season, and Everton appear a little overpriced to me, at [5.4]. I'll back Silva to record a victory over his compatriot Mourinho. The Toffees will travel to Old Trafford in good spirits after winning their last three matches. Late goals last week secured a 2-0 win over Crystal Palace, which followed victories against Fulham and Leicester City. With just one defeat from their four games on the road this season, Everton will fancy their chances against an out-of-form United. I thought Man Utd were flattered a little by the 1-0 scoreline against Juventus in midweek, as for me they were outclassed for the majority of the game. They had to come from two goals down in their last home game to beat winless Newcastle United but they played well when earning a valuable point at Stamford Bridge last week, so it's hard to predict which United will turn up! I can't find anything of interest in the match odds market; I'm not keen on backing the home side at [1.75] but Everton don't historically get much out of this fixture. They are winless in seven matches against Manchester United in all competitions (W0 D2 L5) since a 3-0 home win in the Premier League in April 2015. There have been 31 goals in United's first nine games and Everton's games have produced 27, so there every reason to think there could be a few in this. I will be splitting my stake backing Over 3.5 Goals before the game at anything around [3.6] and placing a keep bet on Over 2.5 goals to get matched at [2.2].